‘Ooh! 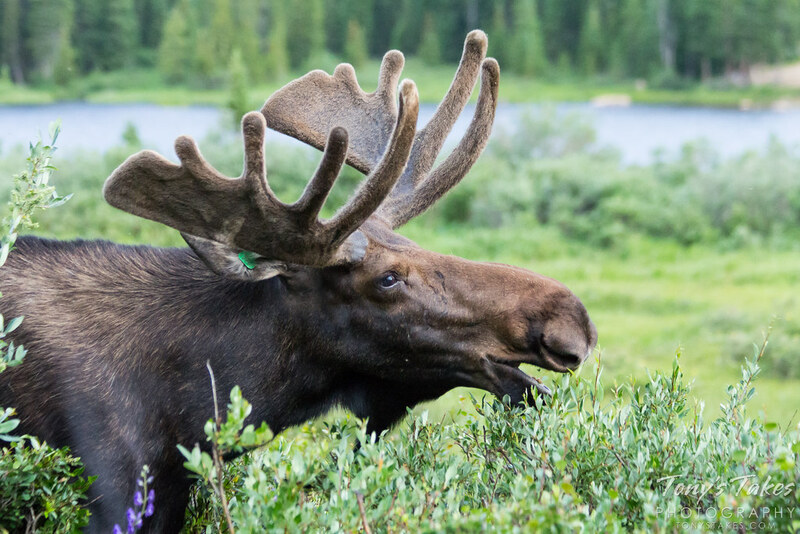 This looks yummy!’ A bull moose at Brainard Lake, Colorado looks rather pleased with his breakfast. 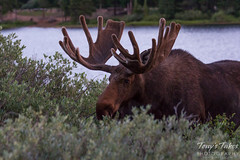 Taken from the relative safety of my truck, getting this image was quite easy as the big guy had no problem walking right up to the shrubbery next to the road. These massive animals are surprisingly fleet footed being able to run at 35 mph for short distances and trot steadily at 20 mph. These two bull moose uneasily crossed paths in the shadow’s of Mount Audubon a couple of weeks ago. 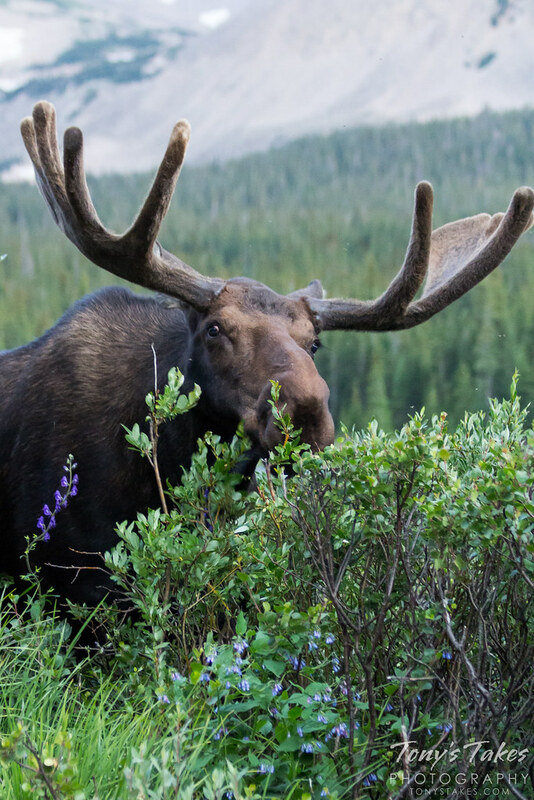 There has been some controversy in recent days when a bow hunter shot and killed one of the moose at this location this past Saturday – I am pretty sure it is the one on the right in this image. It has turned into quite a heated debate. I can see both sides of the issue. I think the hunter would have been wiser to choose to hunt at a time when there were less recreationalists in the area. 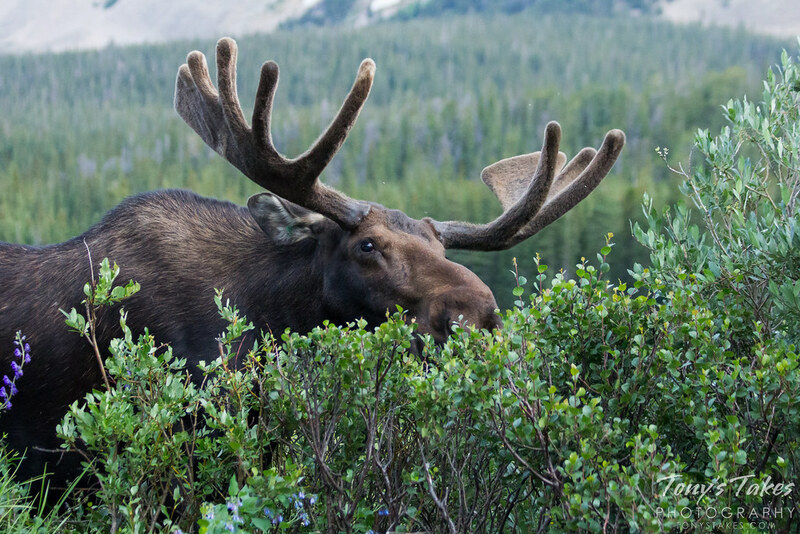 However, hunting is needed to help manage a population that would otherwise harm the environment and jeopardize the habitat of other animals. What do you think? You can read more about the story here. 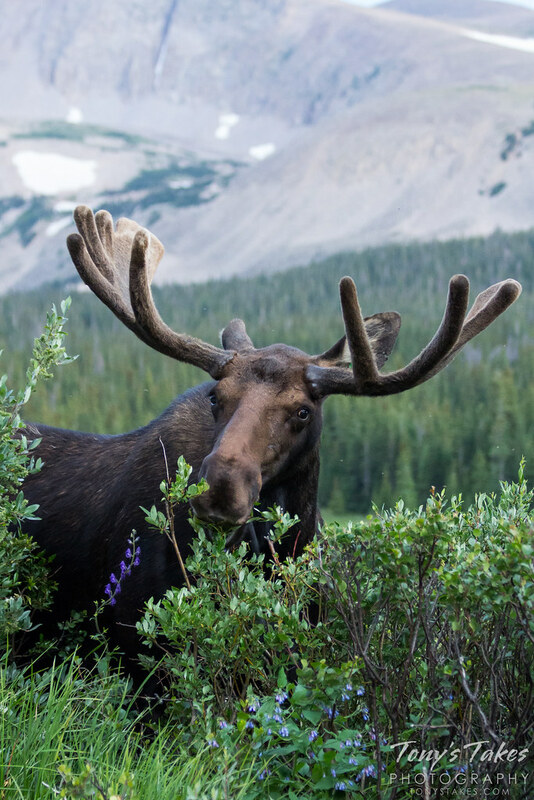 “Look into my eyes…” This large bull moose actually looks kind of gentle as it grazes in Arapaho National Forest, Colorado. With the rut coming soon, it would not be wise to get too close. 😉 Black and white add drama to the this picture. Image captured August 31, 2014. With only a couple of weeks to go until the rut, bull moose are preparing for the annual competition for the right to mate with nearby females. 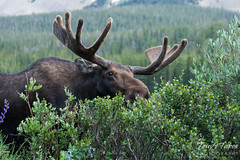 Here, a large bull stops eating to look behind him, keeping close watch on another male that was walking by. 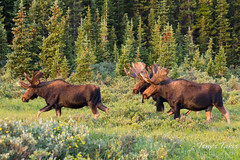 The tension this past Sunday at Brainard Lake in Arapaho National Forest was palatable and fascinating to witness. 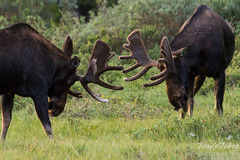 Adding drama is the bloody velvet hanging from the moose’s antlers. 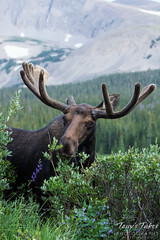 Taken this morning at Brainard Lake in Arapaho National Forest, Colorado . 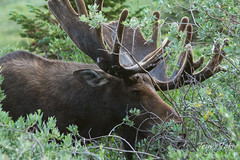 This monstrous bull moose has begun shedding the velvet that covers its antlers. The blood comes from the blood vessel system that forms the skin covering and grows the antlers. 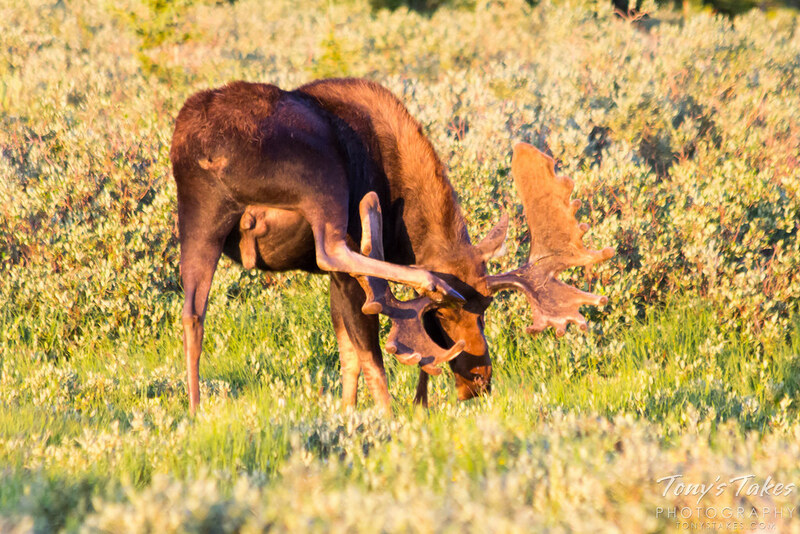 The shedding of the velvet is a precursor to the rut when this male and others nearby will use their massive antlers to battle for the right to mate area females. Can’t I just eat in peace? Taken this past Saturday, July 26, 2014, at Brainard Lake in Arapaho National Forest, Colorado. This was one of five Bull Moose out right at dawn and he was in fact one of the smallest of the group but was about 6 feet tall. In the background is the 13,229 foot tall Mount Audubon. 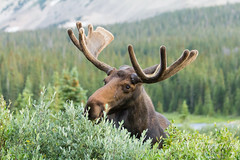 Scroll down below the photo for a complete gallery of moose pictures from that day. 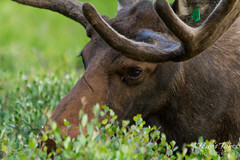 This guy was one of five at a spot in Arapaho National Forest west of Boulder, Colorado this morning. He was one of the smaller ones but also one of the more photogenic. 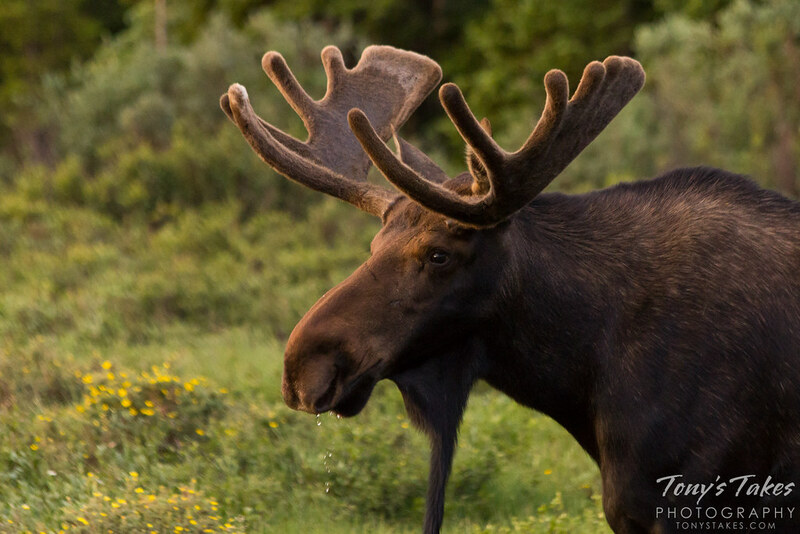 This is the first time I have this close to a bull moose and let me tell you, they are massive, impressive animals to say the least. Their sheer size is absolutely intimidating and nothing you want to mess with.